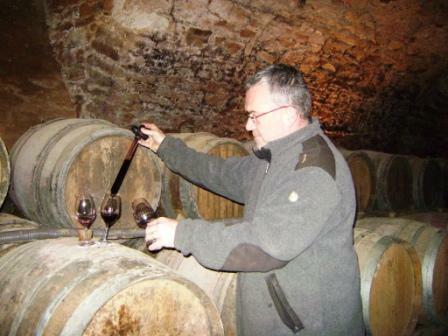 Eric Texier and us go back a long way – YiXin bought his first wine from Eric halfway through Lionel Jospin’s tenure as the French Prime Minister. There have been several Prime Ministes since, and we’ve also seen Eric lose several vineyards due to the property boom (and continually depressed wine prices outside of fashionable regions), whether it’s ‘Les Pends’ in Crozes-Hermitage or ‘Les Cardinières’ in St-Gervais. This might seem like an esoteric point until one tastes at Eric’s cellar – his talent for finding great but obscure terroir is evident when going through the various barrels of all the plots of land he’s picked up. We suspect he’s managed to find those plots due to a unique combination of passion (he loves the old style Rhône wines), inquisitiveness and scepticism (as one would expect from a former nuclear engineer). He’s best known for his wines from Brézème, both white (Roussanne) and red (Syrah), and recently he’s also picked up a parcel in Saint Julien en Saint Alban (also Syrah) from across the river. Further south, Eric also vinifies both white and red versions of Châteauneuf du Pape, both of which are sound, traditional versions which age well. Eric owns some of the land, and has most of the rest under long term contracts, which specify viticultural practice; many of the plots are now certified organic. In the cellar, he has moved towards more traditional methods, eschewing the methods and chemical aids which help wines do well in competitions but reduce their usefulness at the dining table. As a result, these are not facile wines for simple drinking, but wines that require patience and understanding. His wines have outlasted Jospin, Raffarin and de Villepin, and we’re confident they’ll still be delightful when Fillon, the incumbent Prime Minister, steps down.